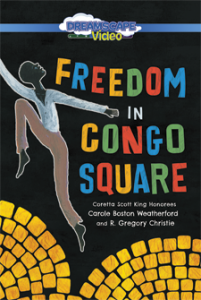 Gr 1-5 –This Coretta Scott King and Caldecott Honor Book by Carole Boston Weatherford, with illustrations by R. Gregory Christie, really takes flight in the lively DVD version. Freedom in Congo Square. 12 min. Dreamscape. 2017. $38.99. ISBN 9781520079066.